Carding staple to make rayon at American Bemberg. In October 1926 American Bemberg began the manufacture of “artificial silk,” or rayon, at its new plant in Elizabethton. The parent company, J. P. Bemberg, was the German affiliate of Vereinigte Glanzstoff Fabriken (VGF), one of the international giants in the production of rayon. Two years later, in August 1928, VGF opened another rayon plant in the small East Tennessee town. This one, then called American Glanzstoff but known now as North American Rayon Corporation, made rayon by the viscose process, whereas Bemberg utilized the cuprammonium process. By the end of 1928 employment at the two plants exceeded 3,000 workers. Visions of economic growth encouraged government officials in Elizabethton to make concessions to VGF concerning property taxes and charges for the huge volumes of water needed to make rayon. They also promised the German industrialists that they would have an abundant supply of docile and cheap–that is, nonunion– labor. The work force soon proved anything but docile. In 1927 and 1928 there were a number of small strikes at Bemberg, which in 1927 resulted in the formation of Local 1630 of the United Textile Workers Union of America (UTW). On March 12, 1929, unorganized women workers of the American Glanzstoff plant led a walkout, and Bemberg workers struck in sympathy with their Glanzstoff compatriots. A second more violent and divisive strike began on April 15 and lasted until May 25, 1929. Labor problems dominated the history of the companies through 1930. Throughout the Great Depression the plants remained operational and, overall, continued to profit. The number of workers employed bottomed out at 2,491 in 1932 and peaked at 4,500 in 1939. During these years the international rayon market experienced highs and lows, as did the United States market. During the 1930s, though, imports of rayon declined dramatically, allowing domestic producers to increase their market shares. Both American Bemberg and American Glanzstoff–as of May 9, 1934, known as North American Rayon Corporation (NARC)–benefited from these market forces. During World War II the plants’ production of rayon yarn increased, and the plants altered production to meet wartime demands. Bemberg, for instance, made parachute cloth. Employment and payrolls increased, but profits went overseas to AKU, Algemeene Kuntzijde Unie N.V., the company created in 1929 by the union of the German VGF and the Dutch N.V. Nederlandsche Fabriek. In early 1942 the Office of Alien Property (OAP) assumed management of the factories and initiated an investigation into AKU’s ownership of the Elizabethton plants and of American Enka. However, seeking to placate the Dutch, OAP did not actually seize the assets of the plants, which in part were enemy-owned. In 1947 AKU and OAP came to an agreement which provided that the Dutch corporation waive all claims to shares of outstanding stock that it or its affiliates owned in Bemberg or NARC, together with working capital, assets, and all of AKU’s interest in patents, trademarks, and other industrial property of the two companies. 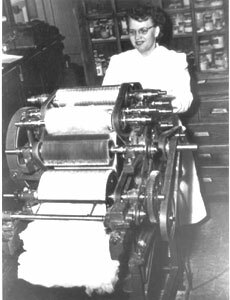 Bemberg and North American remained under government control until their December 1948 purchase by Beaunit Mills, a New York corporation that recently had entered into the production of rayon. Beginning in 1949, the plants entered into a long period of struggle precipitated both by the failure of low-wage industries in the South to experience significant growth and by changes in the synthetic fibers market. To ensure continued profitability, Beaunit switched part of the Bemberg plant to polyester and part of the North American facility to nylon. Moreover, in 1961 Beaunit entered into a joint venture with El Paso Natural Gas to manufacture “nylon 66” at a new plant at Etowah. The plant became operational in 1966 but incurred significant losses for Beaunit. Increased domestic polyester production severely depressed prices by the late 1960s and led to increased foreign competition in nylon. A 1967 strike by leading tire companies compounded Beaunit’s woes, and that year the company’s shareholders approved a merger which resulted in the company’s becoming a wholly owned subsidiary of El Paso Natural Gas. By 1967 employment at the Elizabethton plants had declined to 3,550–down substantially from the 6,000 of 1949. The UTW local, Watauga Rayon Workers Local 2207, continued to represent the hourly workers; their major concern was mismanagement by El Paso. By the early 1970s Bemberg was in serious financial trouble. The cuprammonium process it used produced toxic wastes that the company dumped into the Watauga River. Bemberg found it could not comply with Environmental Protection Agency orders to clean up its wastes and still turn a profit. As a consequence, in December 1970 El Paso announced that Beaunit was going to suspend all operations at the Bemberg factory. But the following March Beaunit sold the Bemberg plant, together with 140 acres of land around the plant, for $350,000 to Abner Industries. Abner acquired an Elizabethton address and officially changed the company name to Bemberg Industries. The new president, A. A. Rosen, hired as executive vice-president Buford Goldstein, a Johnson City native who had held a similar position with Beaunit, and Rosen and Goldstein became the major investors in Bemberg. The new Bemberg continued to experience financial difficulties, though, and again was sold in 1973 to a group of investors called RG Associates, which also changed its name to Bemberg Industries. Still, the company failed to turn a profit and had to face escalating debts. On February 16, 1974, Bemberg filed a petition for bankruptcy. With Bemberg’s demise, only North American Rayon remained operational. But in November 1976, El Paso announced that in 1977 Beaunit would be sold to a holding company named BEM. BEM purchased Beaunit’s assets and in turn sold them to Beaunit II, an unaffiliated corporation set up for the purpose of securing those assets. The Beaunit II investment group that purchased the assets was known as TA Associates. TA continued to operate the plant under the name North American Rayon Corporation. In 1978 TA sold the company to Elizabethton businessman James Walker, who earlier had purchased the abandoned Bemberg building. North American Rayon survived and by the early 1980s was manufacturing rayon for apparel, home furnishings, and industrial products. In order to comply with environmental regulations, however, the company was faced with the prospect of building a water treatment facility. With an unstable market for rayon, NARC officials expressed doubt that profits would be large enough to finance the treatment plant. By the fall of 1985 owner Walker began negotiations with management and union officials to have the employees become company stockholders. Local 2207 voted down the proposed plan, but was instructed by the UTW international office to accept the restructuring designed to turn the workers into “employee-owners.” The plan went into effect in December 1985, and, from that point through 1988, wages increased and employee-owners received dividends. In August 1988 North American Rayon acquired MKS Polyester, which it renamed North American Polyester. The company also contracted with the National Aeronautics and Space Administration (NASA) to make carbonized rayon for the lining of the nozzles of the solid rocket motors that boost the space shuttle into orbit. But the 1990s again ushered in hard times for North American Rayon. Increased competition from imports has hurt the company. Labor relations, seldom harmonious in the past, have continued to be poor as employees feel poorly informed about operations and plant management. In June 1996 NAR Polyester shut down, leaving 70 workers unemployed. Employment at the rayon plant was only at 700 in late 1996, and it continued to decrease until the end of the century. On February 25, 2000, an enormous fire broke out in the North American Rayon plant. It took firefighters a week to extinguish the flames. The plant immediately closed for business. A year later, in mid-February 2001, the North American Rayon plant was demolished, ending a significant era in the industrial history of Appalachian Tennessee.